Today’s classroom looks nothing like it did even just 20 years ago. My children, who are 12 and 14, could not conceive of a school day that didn’t involve using a smart board, accessing the internet to get information, taking tests online, or downloading homework assignments. Gone are the days that kids could hide grades from their parents. Now, parents have instant access to their students’ grades and performance metrics. Advancements in technology are helping both students and parents learn and stay connected. When I think about my elementary school in the ‘70s and ‘80s, I remember mimeograph copies. There wasn’t a copy machine back then, so teachers had to use a mimeograph machine to crank out “dittoes” by hand. 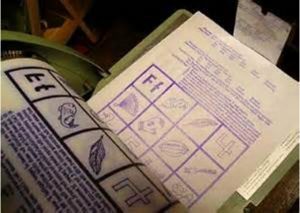 That’s what we called our worksheets, which had purple ink that would come off on our hands. Boy have we come a long way from those days! I also remember real, old-fashioned black boards. The ones where you had to clap the erasers every day to get rid of the excess chalk. The bad boys (or girls) were always sent out during recess or after school to take care of this task. I remember when everyone was crazy about Tamagotchi. We were so obsessed, in fact, that they were banned from our school. This made the school happy; however, I don’t think our parents were too happy that they ended up being full-time Tamagotchi caretakers while we were gone all day! I remember when our teachers incorporated educational shows of the time into our lessons. Some of my favorites were Beakman’s World, Bill Nye the Science Guy, Reading Rainbow, Where in the World is Carmen Sandiego?, Wishbone, The Magic School Bus, and School House Rock. I still remember some of the songs and lessons from these shows. I have used the Conjunction song from School House Rock in my A Grade Ahead lesson, and kids today love it. When I was in school, I remember having to go to the library to do research projects. But, it wasn’t doing research on the computer—it was using informational books and encyclopedias! I would handwrite all of the notes I would gather, and then type out my paper on the library’s computer. To save my paper, I would have to use a floppy disk. When I was in elementary school we would have to complete biography projects using 3 different sources of references for our information. The different types of references would be an encyclopedia, nonfiction books, and newspaper articles. In order to locate a newspaper article you would have to reserve time in the library to pull these clear plastic slides of film called microfilm into a projector and roll through them until you could find an article regarding your subject matter. There was not a search key and we would spend hours rolling through film to find one article for our projects. I remember my 2nd grade teacher, Miss Short, was one of my favorite teachers! We frequently had time set aside in class to do art projects, which I loved. I specifically remember sketching teddy bears and another time drawing light houses with chalk. We did a lot of light house drawings and paintings. She also taught us the alphabet in sign language. For the 100th day of school, we each got to make something using 100 of a common household item. I made a dog house for my Barbie’s dog out of sugar cubes. These fun, creative times were some of my favorite school memories! So many things have changed in education beyond the curriculum. What do you remember most from your school days?